Along with your trolling motor, driftsocks are among your best options for boat control. 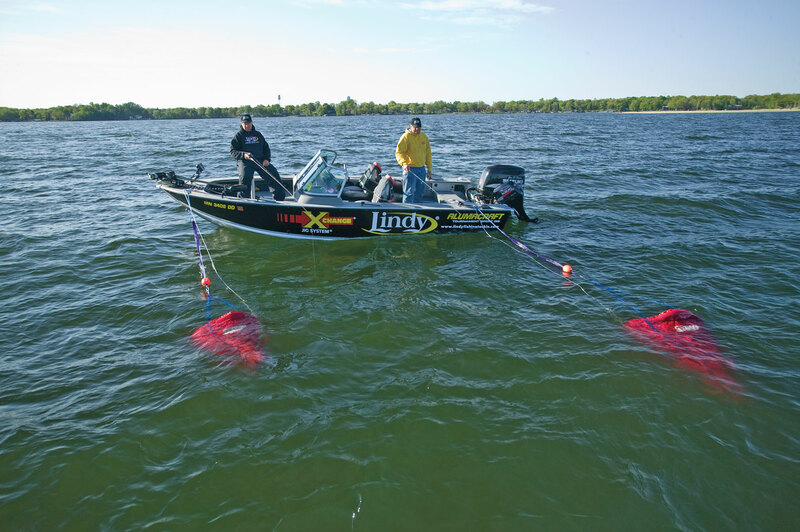 That's no surprise to top walleye experts who use the handy bags when boat position and precise maneuvering are critical to presentation effectiveness. It seems only natural that walleye anglers pioneered many driftsock strategies. Use driftsocks for walleyes to slow your boat's drift speed in high winds. Control boat position and swing while anchored. Intricately maneuver along tight contours while trolling. Fine tune trolling speeds. As far as fishing equipment goes, a driftsock is one of the least expensive investments you can make — but with a little practice the payoff is huge. Don't Forget the Dump Rope — A dump rope is a section of rope attached to the small end of the driftsock. The other end of the rope is attached to the main driftsock tie-off at the boat, or on the sock near the tie-off, as long as it's within reach while the driftsock is deployed. To retrieve the sock, pull the dump rope to collapse the sock from small end first, essentially emptying water from the bag as you retrieve it. In stronger winds deploy a driftsock (or two) off the stern while you use your bowmount trolling motor to propel the boat forward with the wind. The driftsock slows forward progress, allowing you to fine-tune speed with the trolling motor. Use the wind to your advantage for presentations along contours. In this example, with wind blowing into the contours, deploy a driftsock off the side at the back of the boat. While you use your bowmount trolling motor to make forward progress and hold the front end in position, the drift sock keeps the back end from blowing into your spot and maintains the boat in parallel position to the contours. Use a driftsock to control drift speed on lakes and reservoirs. A single primary driftsock positioned off the side and towards the back often keeps the boat parallel to the wind. Sometimes a second sock (often smaller) towards the bow is necessary to fine-tune your drift. Deploy a driftsock off the stern to reduce boat swing while anchored in current. Deploy off port or starboard sides towards the back of the boat to adjust boat position. The boat angles opposite from the side that the driftsock is tied.